In the face of global injustice, climate catastrophe and a lack of meaningful jobs – today’s children should be taught that maybe all that escapism will have to wait. This summer he turned his words into reality in the kingdom of Weston Super Mare. 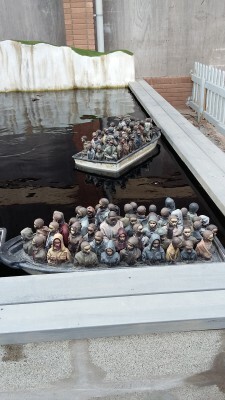 In a 2.5-acre park he created Dismaland – a ‘bemusement park’ for the 21 Century. Dismaland is more than an art exhibition, the viewer is invited to think and not just consume, to participate and not just observe, to question and challenge ‘common sense’ and most important of all to rebel. 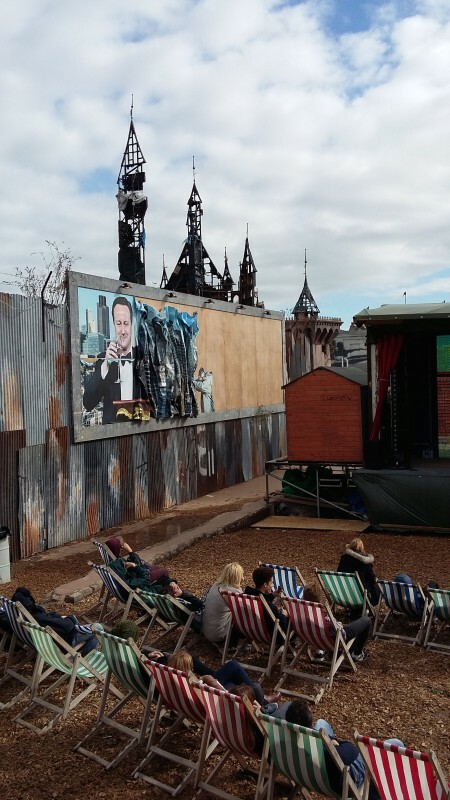 There are two elements to Dismaland. First there is the space given over to the ‘funfair ‘ and installations. The second are the three galleries containing contemporary art. As you enter the park the first think you see is a massive run down Disney castle. 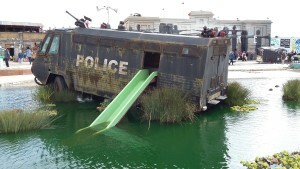 It is surrounded by a polluted moat in which Banksy has placed two installations, one is a hallucinogenic sculpture of a mermaid, the second a police riot van with a slide coming out of the side. As you enter the castle, staff try to persuade you to have a “no obligation to buy” photograph taken of you. Most people say no, but a few brave souls stand in front of a white screen and have their portraits taken. Inside the castle its pitch black, suddenly flash bulbs go off. In front of you life size models of paparazzi take photos of an overturned horse and carriage with a dead princess hanging out of it. The fairytale has become a nightmare and the reference to the death of Diana is obvious. At the exit of the castle the photographs are waiting to be collected and paid for. People are shocked to discover that their smiling faces have been superimposed in front of the dead princess and carriage carnage. In every corner of the park there are installations of ‘typical’ seaside funfair games and attractions, all are subverted to make a political/social point. You are encouraged to try and knock a metal anvil over with a ping-pong ball. You can pilot a motorboat around a pond – the twist – it was a boat full of migrants attempting to cross the English Channel. People clumsily ferry them across the pond, dodging floating bodies and steering around aimlessly until their money runs out. At one point I found myself outside a pocket money loan shop. It offers children mortgages to buy rides on bouncy castles at grossly inflated rates. Intently reading a poster outlining the scheme was a young boy; horrified he looked up at his dad and said, “This is a con”. Smirking his dad said, “This is a taste of what’s to come in life”. 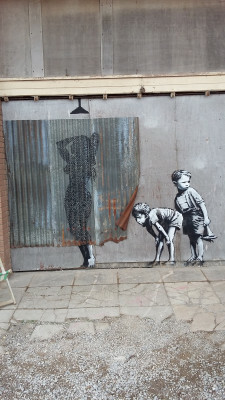 Banksy, described Dismaland as “a festival of art, amusements and entry-level anarchism”. He wasn’t joking; in one tent you find stalls promoting a number of political and trade union campaigns. In another marquee there were political banners made by Ed Hall and political posters by a number of street artists. 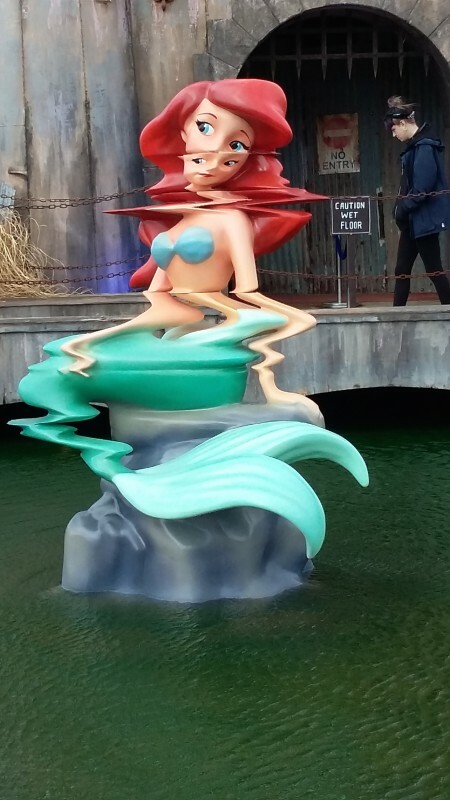 The second element of Dismaland are the three galleries. They are described as, “The finest collection of contemporary art ever assembled in a north Somerset seaside town”. Here you can see works by Banksy, also showcased is work by more than 50 other artists. They include Damien Hirst, Jenny Holzer, David Shrigley, Shadi Al Zaqzouq and Jimmy Cauty (KLF fame). These works of art are engaging and at times disturbing and often both at the same time. In one room a Grim Reaper rides around in a dodgem car to the song Night Fever. Another exhibit by Damien Hirst is of a unicorn in formaldehyde in a glass box. Then there are political works; Sami Musa’s work is inspired by the Palestinian resistance in Gaza and Shadi Al Zaqzoug by the Arab Spring. Jimmy Cauty has created a miniature model city, a dystopian world frozen in time at the moment after a huge wave of social unrest. 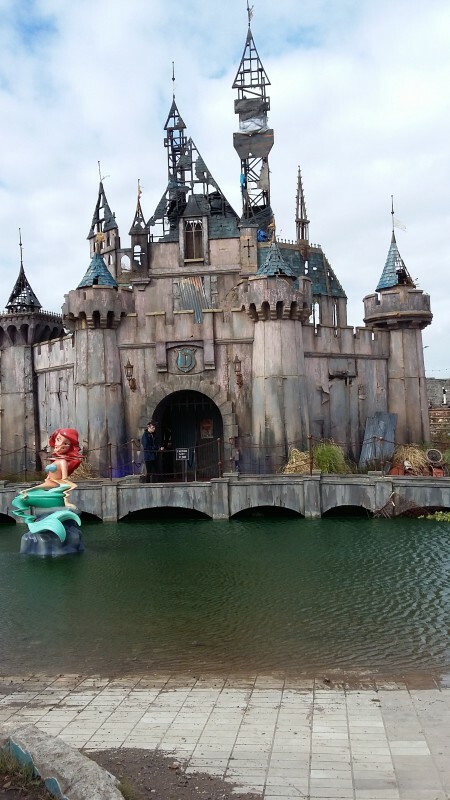 Dismaland brings out the contradiction between art and capitalism. It lands some heavy blows against the rich and the powerful. But there are moments when you feel slightly uncomfortable. It is depressing to have private security goons searching your bags on your way into the park. It was a bit ironic seeing young artists having their spray cans confiscated. Large black balloons with the words “I am an imbecile” written on them were given out to some people. It was a cheep joke and the victims tended to be working class families. But these are minor criticisms. 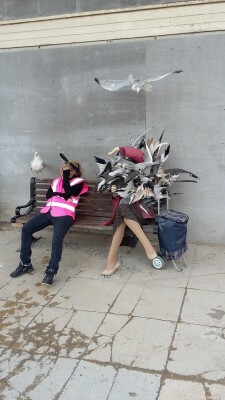 Dismaland is a riot of ideas and energy. Last night at 10pm Dismaland closed its doors for the last time. But like all fairy stories there is a happy ending. A number of artists have donated their works to raise money for refugees and all the building materials used in the construction of Dismaland are being shipped to Calais to help build shelters for the refugees living there. Thanks for this brilliant insight to Banksy, contemporary art and the power of the visual. Thanks Roger, I intend to post up some more photos from Dismaland soon and some works by young street artists from Weston Super Mare.